This entry was posted in Life in General, My Art & Writing and tagged art, desires, dreams, intimacy, love, paints, passion, poetry, portraits, relationships, romance, thoughts, writing. Bookmark the permalink. 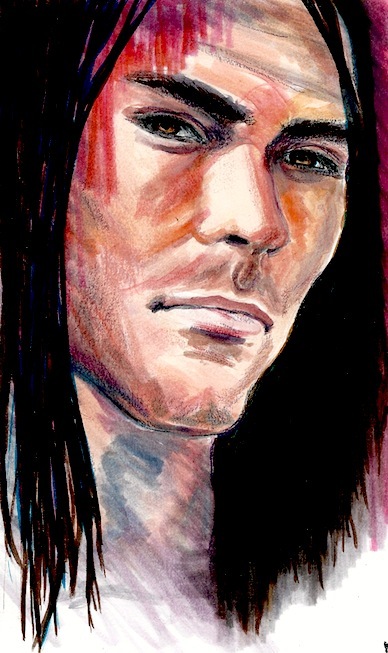 Beautiful Drawing AnnMarie as always! Keep up the good work! AnnMarie= Number One! Your welcome AnnMarie! Hope you had a beautiful day and have a beautiful night! Well I might need to go back to 150mg of lamictal or I might have to just wait out the side effects I seem to be suffering from the adjustment of the meds. Unfortunately when you do adjustments there are side effects and either those pass or you have to go back to the reg dose. I am sure my doctor when he calls will know what to do tomorrow. I couldn’t sleep too well last night so I wrote 2 lists for my friends Paris and Heather like I did for you 101 reasons to Love AnnMarie. I did it for them. Heather loved it and I am guessing Paris will love it too. Paris could use it to help her. She suffers from social anxiety and thinks people are always judging her. Struggling in having self confidence and believing in herself. Well I gave her a 101 reasons to believe in herself and have confidence. Whenever I feel bad or terrible I find doing something kind for someone else makes me feel a lot better. I’ll let you know what happens tomorrow with the dr. You take care too and keep making that beautiful awesome art! AnnMarie= Greatest Ever! Talked to my doctor he decided to go readjust the dose go back to the reg dose. I think all will be fine now. He seemed to think it would need to take longer for that decrease to effect but he wanted to go back to reg dosage because he was very concerned. I can’t wait to go back to writing my horror book its so much fun. Thank you AnnMarie you are the brilliantest person ever and the greatest woman ever! May take a few days to get back to feeling better but glad everything got taken care of today. Glad things are working out. You have a good day, Dan. Feel well. Thanks AnnMarie you have a great day too! This face seem familiar – kind of like one that I’ve drawn several times through the years. Great message with it. I appreciate your words here. How have you figured out how I look like? Hope all is well in the I-land. Thank you, I appreciate your kind words. Miss AM, here’s what you must do — and you must do it quickly — you must … “wine” about it! 😉😎 Put your feet up, sip, relax. Let your mind drift to other, more pleasant places than the classroom … a place where Squanto will give you a foot massage. And then remember: Tomorrow’s FRIDAY!!!!!!! Yum…ohhhh, did I say that out loud??? Lovely lips…definitely. I have a little crush on this picture (shh, don’t tell my giant husband ;)). Two words; Meeeeee owwwwww or is that one word? Either way I know you get me.